This account will only hold tax-free muni CEFs, and will DRIP. Every week, I invest a small amount (~$150.00), pro-rated in closed end funds (listed in post title) as found on cefconnect.com. 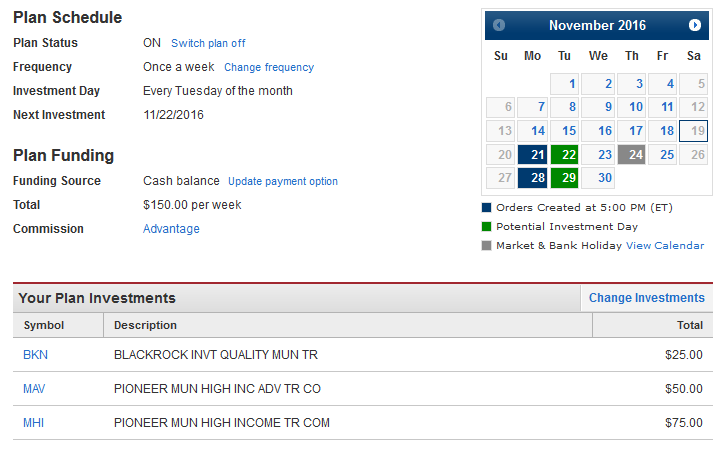 UPDATE: October 15th, 2016 I decided to make the ‘sharebuilder’ investments weekly, every Tuesday. For October, 2016, investment amounts will be divided amongst the 17 new to the portfolio tax-free muni CEFs; BBK, BFK, BKN, BTA, EVN, FMN, IQI, LEO, NAD, NVG, NZF, OIA, PMF, PML, PMM, PMO, & PMX @ $56 each. This amount is approximately equivalent to 12 investments @ $79 each ($79 X 12 = $948), minus $1 for each trade after the first 12 ‘free’ trades on the sharebuilder ‘Advantage Plan’ ($56 X 17 = $952) and ($952 – $5 = $947). November’s investment schedule has not yet been determined. The October sale & purchase effectively reset this account to the tax-free muni CEF strategy. The number of tax-free muni CEFs in this account is 23; BBK, BFK, BKN, BTA, CMU, CXE, EVN, FMN, IQI, LEO, MAV, MFM, MHI, NAD, NMZ, NVG, NZF, OIA, PMF, PML, PMM, PMO, & PMX. A change was made to the investment schedule to invest every Tuesday beginning October 18th, 2016. I will pro-rate the investment amount for the three (3) tax-free muni CEFs (Closed End Funds) being purchased. The dates spreadsheet (which calulates these investments automatically! ), showing the ex-dividend and payment dates for these CEFs, can be found in my google sheets. I also try to keep the calendar on my blog updated.